This post brought to you by eclos Skin Care. All openions are 100% mine. I had a skin problem before. I saw a dermatologists who put me on regimens using things defferent stuff. that only seemed to make my skin worse. In my teenage life, when I took my daily vitamin regularly, supplemented with minerals like Zinc I was realize that my sensitive skin did much better I stay away from harsh chemicals. I have a tan skin which is good because i don't have to go the tanning salon. Some women has a white skin they have to make their skin tan. Brown skin has more attracted than whiter skin which is true. I am the one who's skin is tan. I don't have to worry about it for my skin because it look beautiful for me. I love my own skin. Lol. I am noticing some of my old problems is creeping back in Dry skin, acne and fine lines are not my type I've tried many different skin care lines, for hopes that they wouldn't cause more sensitivity issues. I've found a few that I have felt good but it never made me completely happy. 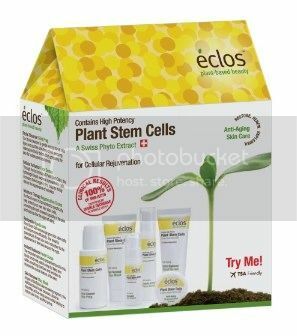 Until oneday i had the opportunity to try the eclos Skin care. For this The anti-aging product it makes protect my skin. It features Apple Stem Cells extracted from a rare Swiss apple which have shown tremendous ability to stimulate skin stem cells, encouraging aging skin to behave like younger skin. Plant extracts, vitamins and anti-oxidants combine with the Apple Stem Cell technology to help minimize the appearance of fine lines, wrinkles and tired skin. Similar on the products were once only available from specialty brands at department stores with a high price tag to match. éclos is the first brand to bring this active ingredient to mainstream stores at a fraction of the cost making our beautiful and younger skin it's available to women everywhere. It means it has no sensetive issues. All of the products are formulated without synthetic fragrances, dyes, best for anti-aging skin care. It really doesn't take much and it helps reduce the appearance of fine lines and wrinkles.The Restorative Eye Cream is like a lotion, but a little thicker. You apply it morning and night before bed time.makes me feel looks younger i love the fact that i used this product because we don't want to get older even i say get old lol. everybody gets old we try not to worry because there is a product that make your skin looks younger promise you like it buy now like me. I know we all love have a good looking skin try it now.